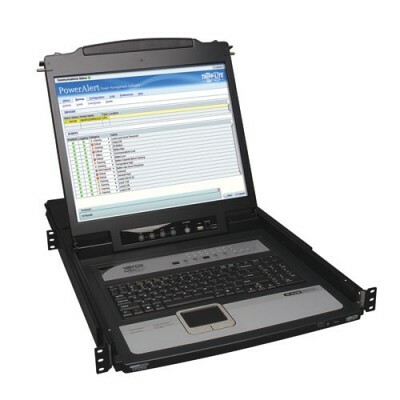 The B020-U16-19-IP NetDirector 16-Port 1U Rack-Mount Console IP KVM Switch combines a 16-port KVM switch, keyboard, touch pad, numeric keypad, 19-inch LCD and built-in IP remote access into a compact housing that stores neatly in 1U of rack space. Ideal for data centers, server rooms and other environments with multiple servers, the B020-U16-19-IP lets you handle complex problems without needing to be on-site, which saves money and time. You can control up to 16 servers or computers directly from the KVM switch or remotely from anywhere else via LAN, WAN or the Internet, including system administration, BIOS-level troubleshooting, GUI application installations and equipment reboots. The built-in 19-inch monitor supports VGA video resolution up to 1280 x 1024 (@ 75 Hz). Compatible with both USB and PS/2 connections using the included cable kits, the KVM switch allows you to select a connected computer using console buttons or keyboard hotkeys. It supports IPv4 and IPv6, as well as Link Local IPv6 Address and Stateless Auto Configuration protocol. The B020-U16-19-IP is compatible with all major operating systems and web browsers. Three levels of password protection, as well as advanced encryption and activity logging, keep your confidential data secure. You can create up to 64 user accounts, which can communicate and manage port access through a message board. An external USB port lets you connect a flash drive or card reader to share external data among connected computers.